Saturday 5th. October, 2013 -- Weddings, as usual. 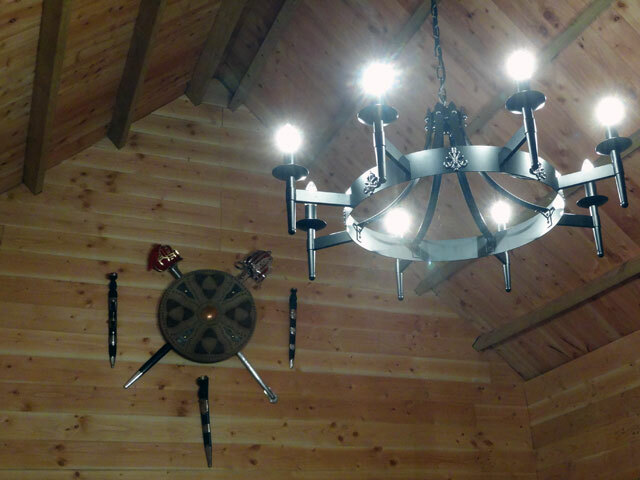 A picture of the light-fitting in the Bothy. Doesn't it look baronial? Today, after walking Mix and breakfasting, I met with Tom and we cleared the front of the Bothy and fitted up some internal decorations on the bothy walls. The light fitting has now arrived and this was fitted up in the afternoon by David. At lunchtime we all dined at Pearsons (I had haggis, neaps and tatties) and then it was back to the Granary for David to fit up the light-fitting and for us to take delivery of a number of bookcases from IKEA. One arrived broken and I spent almost an hour on the telephone before I could get through to someone who agreed to change it as quickly as possible. The bookcases are all flat packed and it will take us a few days to assemble them, but once assembled, I think that they will look superb. After Tom and David left, I erected the first bookcase and put it roughly in position. Ann arrived (tomorrow is another kilt-making day) and later Rachel returned from her glass class. Mum too was home from her visit to the Guild at Gavinton where she had been sharing her memories of Bletchley Park. In the evening Olive had a student for some private study – she is being kept busy with students just now. We dined in the farmhouse and in the evening I prepared the music for Arrochar this Sunday and then dozed in the Granary – I have to be fit for erecting bookcases tomorrow. Today the Smith Commission proposed that Scotland be given some more powers over income tax and some welfare benefits. It has been interesting to see the Great Britain parties claiming that this has been a massive transfer of powers while the SNP and the Greens have said that it comes nowhere close to what the national leaders promised in their by now infamous ‘Vow’. I regret that the Scottish parliament has not been given more control of the leavers which would make it most easy to stimulate the economy. Having said that, I think that there is scope to use the new powers, once they come, to show the rest of the United Kingdom the way in terms of working towards a fairer country. I look forward to the Scottish Government having a large tax band from £10,000 to £15,000 income with a nil level of tax, while increasing the current tax rate for those above that figure. (Making little difference for those earning just above that level but enabling the rest of us to pay a bit more to help those who at present have to use food banks). I look forward to the Scottish Government exploring new ways of using the ability to create new welfare grants more appropriate for our country in the twenty-first century. I suspect that politics will be exciting over the next year or two.